You are sitting in a lecture hall at 11:49 a.m. having forgone breakfast yet again to make it to class on time. In these last few minutes of class, fatigue and hunger hit you like a truck, and the lecture becomes inaudible. Suddenly, your classmates pack their bags and disappear: it is finally time for lunch. After a trek to the DUC-ling, you balk at the sight of large, metal vats of cold mashed potatoes and shanty bowls of beyond-chicken wraps presented to you. You disdainfully walk to your room and open a bag of Cheetos. If you can relate to this story, fret not, for this is to be expected with any Emory meal plan. Luckily for the adventurous undergraduate, Emory University hides a rich reservoir of less-than-typical food options available for just a few Dooley Dollars. If you are not a regular visitor of the Few Mail Center — perhaps because your family doesn’t love you enough to send you things — you may have missed the Grab and Go station located outside. From 11 a.m. to 2 p.m. on weekdays, enjoy an entree, a side, a drink and a dessert for one meal swipe. The menu offers similar options to its equivalent at White Hall, though the inclusion of a freezer offers the option of a King of Pops popsicle if you love the thought of flavored ice dripping on you on your way to class. The Farmers Market is a staple of the Emory community and if you take the time to explore its many options, you will realize that Tuesday lunches are filled to the brim with gastronomical potential. Rey Martinez Cuban Cuisine offers meal combos such as rice and beans with plantains for a reasonable $5, and for the degenerates among us that prefer to drink their meals, Honey Bubble sells bubble teas for $4, their best option being their taro tea. Not only does its purple color make it a great addition to any Instagram, but it also adds a savory flavor that blends well with the sweetness of the tea. The quality of Rollins Cafe’s food almost justifies the enormous debt that comes with a masters in public health. Though it is a bit of a trek from the center of campus, students can find culinary solace on the first floor of the Rollins School of Public Health. Their made-to-order flatbreads and quesadillas are piping hot, a rarity amid the sea of cold sandwiches at White Hall and lukewarm rice bowls at Cox. 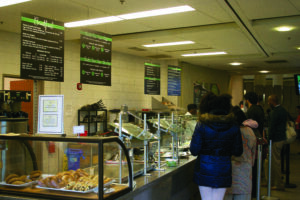 From the stir fries to the sandwiches, Rollins offers a variety of options that cater to a wide range of tastes. Those who don’t live on Clairmont may not realize that the SAAC is the unrivaled best place to use a meal swipe, as it gives you an entree, a drink and a dessert. The biggest appeal, according to my carnivorous friends, is the fresh ground beef that goes into the burgers, and if you enjoyed the guilty pleasure of cheap cheddar cheese-covered pizzas of elementary school birthday parties, the flatbreads of the SAAC bear a strong resemblance. Whether you are flush with Dooley Dollars or subsisting on water for the rest of the semester, diversifying your meals every now and then can add some spice to your life. Until the post-college life liberates you from the culinary shackles of this university, make the most of what you have and grab a veggie flatbread at the Rollins Cafe.